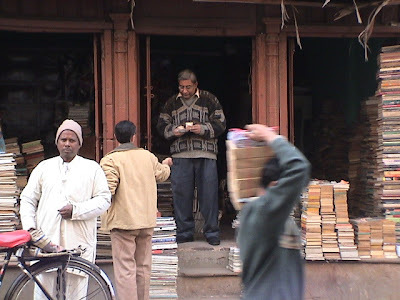 new delhi: a bibliophile’s paradise. that’s what the daryaganj sunday book market, famed among students and infamous among the established book shops, is. generations of literature students swear by the market that supplied almost all their textbooks at less than a quarter of the original price. of course, the cover might have been be dirty and the pages crumpled. books travelled from one generation of students to another but the prices remained static, more or less. the character of the market is, however, changing of late. buyers are no longer exclusively literature, sociology or economics students looking for an out of print tome. instead, the bestsellers are books on information technology. on any sunday morning, people can be seen browsing through the latest in web-enabled applications or choosing which cd is worth the rs 10 it costs. unshaved, unbathed, many just pack off first thing in the morning, equipped to spend the rest of the day in the market. shubhashish dutta, a resident of mayur vihar pursuing an advanced diploma in computer applications, says he has reached the market early because this is when the best titles can be picked up. ‘‘later in the evening everything is sold,’’ he adds. satish kumar gandhi, who has been selling books here for the past 30 years, says these days he only stocks technical and it-related books. ‘‘i used to sell fiction earlier, but nowadays the demand has shifted to computers. people don’t want to pay more than rs 20 for a novel but can pay anything for a technical book,’’ says gandhi. but although more money is flowing in, the general quality of the visitors has deteriorated, says the bookseller. gandhi says he picks up books from auctions at the railway station. ‘‘publishing companies auction books that don’t sell. some of the books are also picked up from scrap dealers,’’ he adds. one may mention copyright laws and piracy, but given the demand for books and the lack of public libraries, controlling this phenomenon is difficult. for a market that has survived six decades, such hurdles are not daunting. sellers insist that piracy is not rampant, and is limited to the potboiler. there is, however, a seedier side to the market. a large and floating clientele visits it for pornographic material and, if the shopkeepers are to be believed, create a nuisance. 76-year-old noor ilahi, himself near-illiterate, is a connoisseur as far as books go. but even he has started stocking technology and it books. ‘‘nowadays children are more pragmatic, they are not interested in knowledge. their only motive is making money,’’ he says.